Agronak gro-Malog, the Imperial Arena Grand Champion asks you to find proof of his noble birthright. What dark secret lies in Crowhaven? Speak with Agronak gro-Malog about the Gray Prince. Journey to and through Crowhaven until you find Lord Lovidicus. Defeat or evade Lord Lovidicus, and find his journal. Return to Agronak with the journal. Speak to Agronak gro-Malog in the Arena Bloodworks about "The Gray Prince" to begin the quest. He asks you to find proof of his noble birth, marks the location of Crowhaven on your map and gives you a mysterious key, but he is unsure what it opens. Journey to Crowhaven (northwest of Anvil) to begin your search. Bring cure disease potions or spells if possible as you may catch something from one of the denizens of this forlorn place. Enter Crowhaven—the presence of evil is unmistakable—and explore, killing all in your path until you find the locked "Old Wooden Door" (gro-Malogs' mysterious key will open it) and continue inside. You'll eventually find Lord Lovidicus who will attack you on sight. Dispose of him and continue on, exploring the area to find several chests, various small treasures, and the journal of the recently departed Lord Lovidicus on a table. If you sneak, no fighting is necessary. Only the journal is needed; take it, and leave if you choose. Return with the journal to Agronak gro-Malog in the Arena Bloodworks, and receive the Gray Prince's Training (permanent +3 to Blade, Block and Athletics) as your reward. Note that this training is treated as a permanent ability by the game and does not count toward leveling up, unlike most other free skill boosts. After Agronak trains you he will read the journal. He will be totally horrified at his vampire origins, so much in fact, that he will be completely convinced that he is a spawn of evil and does not deserve to live. As a result, he will not fight back when you fight him at the end of the Arena Quest. If you plan on completing this quest be careful not to say that you wish to challenge Agronak for his title of Grand Champion, as you will no longer be able to talk to him. Doing this will result in having to kill him and thus failing the quest. It is possible to yield to Lord Lovidicus but the respite is short-lived. He will say "Release! Sweet Release! After all these years, these decades, I am finally free! And you! So... so fresh! I must feed! I must feed! Agghhhhh!" and resume combat. He also has unique combat dialog, saying "I have not eaten in decades... YOU will be my feast! Rrragh!" , "Food!'". 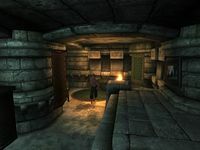 Killing Agronak in the Arena after completing this quest will be counted as a murder by the game as he is a non-evil NPC who does not attack you (though this will not result in a bounty only because there are no other actual NPCs in the Arena at the time) so if you have not murdered anyone before completing this quest line, it will attract the attention of the Dark Brotherhood. However, killing him in the Arena without completing this quest line will NOT attract the Brotherhood's attention. Lord Lovidicus is a vampire (he has all of a vampire's bonuses and abilities), however it is not possible to catch Porphyric Hemophilia from him. He does not leave Vampire Dust on his dead body. The journal of Lord Lovidicus is a quest item, and will become stuck in your inventory if the quest is terminated before completion by Agronak gro-Malog's death. This quest was supposed to add a point to your fame upon talking to Agronak after finding the journal. An improper script command was used to modify your fame player.modav fame 1, so the fame statistic is not incremented correctly (it should be modpcfame 1). 10 Agronak gro-Malog, the Imperial Arena Grand Champion, has sent me on a quest to find proof of his noble birthright. I must journey now to the west, to a place called Crowhaven, and begin my search. Gro-Malog has provided me with a key I will surely need, but even he is unsure what it opens. 30 I have discovered the Journal of the Lord Lovidicus. It does indeed contain information about Agronak gro-Malog's birth, but proves he was the spawn of a vampire! Agronak won't be happy to hear this, but it is the proof he wanted. I must take the journal to him at the Imperial City Arena Bloodworks. 100 1Yes I have given the Journal of the Lord Lovidicus to Agronak gro-Malog. In return for my assistance, he has shared some of his combat knowledge. 115 1Yes Agronak gro-Malog has been killed, and my quest to discover his true identity can never be completed. It is possible to use the console to advance through the quest by entering setstage MS52 stage, where stage is the number of the stage you wish to complete. It is not possible to un-complete (i.e. go back) quest stages. See SetStage for more information. Esta página foi modificada pela última vez à(s) 14h55min de 30 de outubro de 2014.